Arranged more or less chronologically with the most recent at the bottom and the oldest at the top. The item at the bottom of that stack is an ink eraser, used for scraping the ink off the page. I have a few of these. They’re often mislabeled as scalpels or lancets. This one, however, uses a monarch stamp. Essentially these stamps are just a picture of a crown with two letters to designate which monarch: G. R. for George Rex1, W. R. for William Rex, and V. R. for Victoria Regina. There were a very few razors stamped E. R, for Edward, but I don’t have any. Seems simple right? The Georges. Well, most of them. 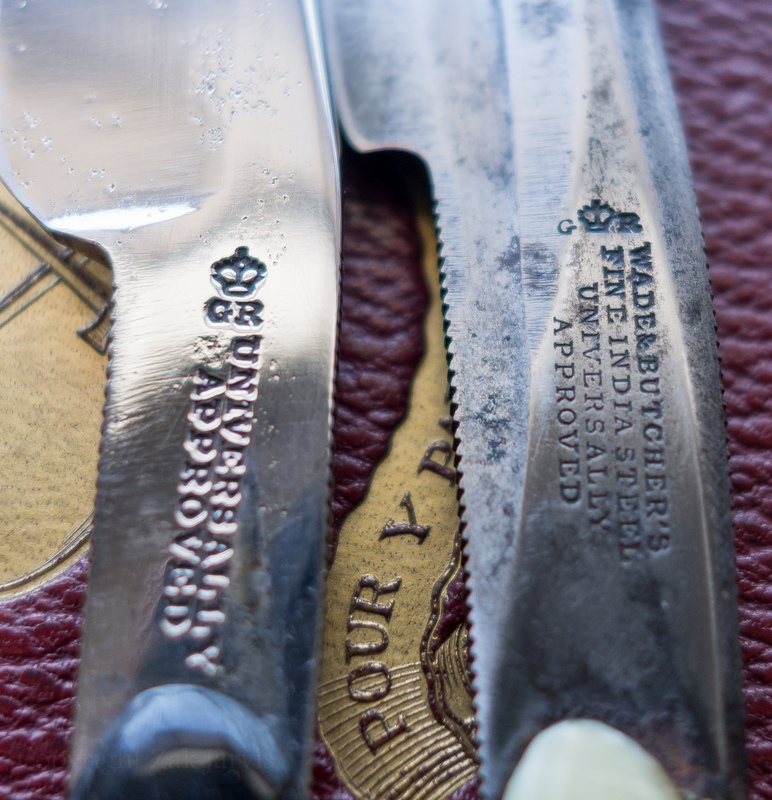 George IV – 1820-1830, was, to the best of my knowledge, the first English monarch to get advertising for his vasty Kingitude stamped into cutlery. It’s a little hard to tell because the outgoing king was a George too, and before that one, they really weren’t doing the crown mark thing. It really does seem to have started in the 1820’s after the coronation of George IV. 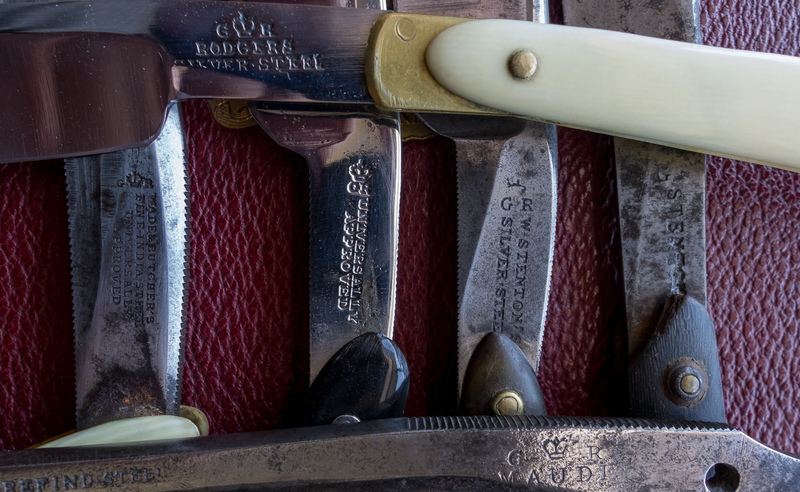 Being that I like to collect really old razors, the majority of the ones I have with crown marks date to his reign. William Stenton, sometimes called Devil Stenton, originally worked as a manager for the Sandersons2 until his abrasive personality got him fired in the mid 1820’s. 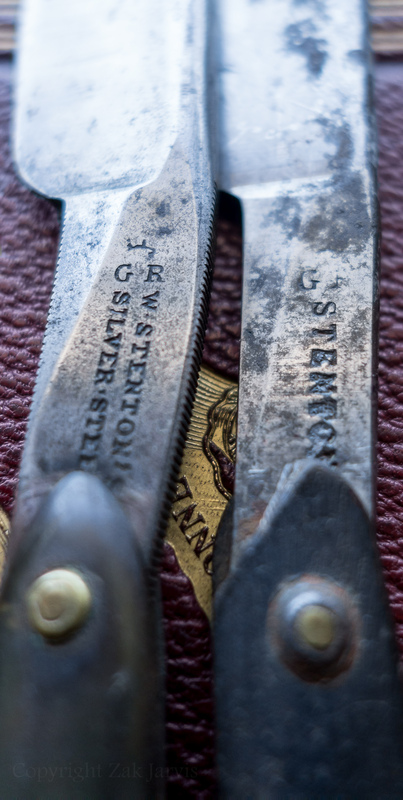 He immediately went to work for George Wostenholm, but didn’t stay there long either, finally pulling up stakes and taking his kids to New York City, where he made razors stamped ‘AGAIN SUPERIOR’. These two date to the early 1820’s. 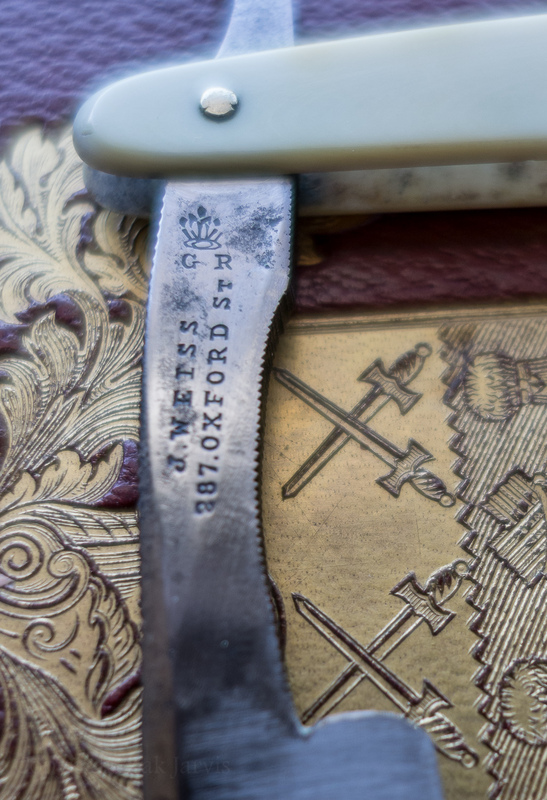 The really rusty one has one of the oldest Masonic etches I’ve seen on the blade face. 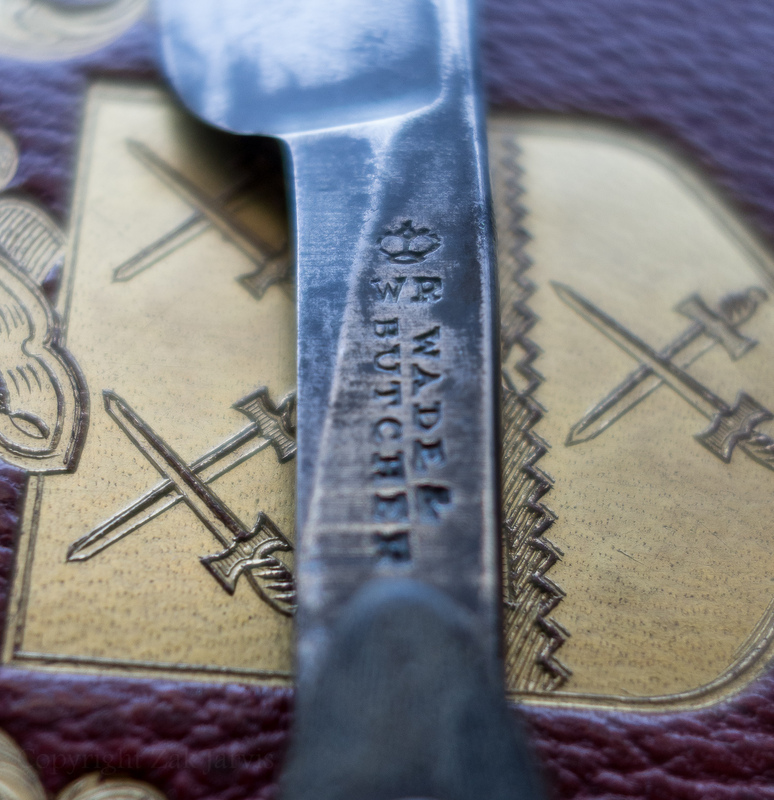 These two Wade & Butcher razors probably both date to before Robert Wade died. Sometimes I try to convince myself there’s some significance to whether the two letters are separated by the crown. So far, I haven’t been able to make a compelling case for it, because the razor on the left was almost certainly made before the razor on the right. These are almost certainly Joseph Rodgers, from before he became ‘cutler to his majesty’, which gives me an unusually precise date of manufacture — after July 1820 (when George IV took the crown) and before 1822, when Rodgers was appointed the royal warrant and started stamping everything with ‘Cutlers To His Majesty’3. I have absolutely no idea who ‘MAUDE’ was. There aren’t any records of anyone with the last name Maude working in Sheffield until the 1850’s, far too late for this razor. There’s one other razor I can find with that mark and it also bears the GR stamp. It’s tempting to guess it was a London cutler, even though the style is very Sheffield. 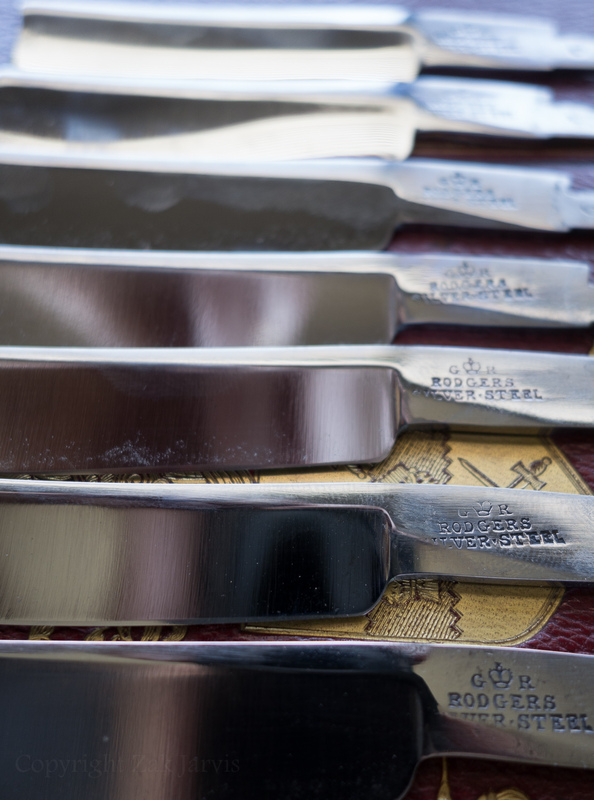 A lot of cutlery was made in Sheffield but stamped with a London maker’s mark. I found this one embedded in a chunk of hickory, having served time as someone’s patch knife4. William IV – 1830 – 1837 didn’t leave much of a legacy behind in sharpened steel. WR stamped blades come up, here and there, but they’re comparatively rare. I have only two. This very simple Wade & Butcher razor has some of the oddest scales I’ve seen. They look like they’ve been shellacked, and who knows, maybe they were. The blade itself is so darkened with corrosion that I wonder if it wasn’t originally blued5. At this distance of history it’s impossible to tell, since bluing is all about controlling a process that happens naturally. You can read more about Edward Allison here. Victoria 1837-1901. Though I have quite a lot of razors made during the (long) reign of Victoria, I only have two razors with her stamp, and they’re both the same model from the same manufacturer. Whether the fad for monarch stamps had faded or cutlers just didn’t feel right producing masculine items dedicated to the queen, the number of razors produced with VR stamps seems oddly small. Though it’s partly an artifact of my collecting mostly older blades, it is also partly due to their simply being fewer with these stamps. 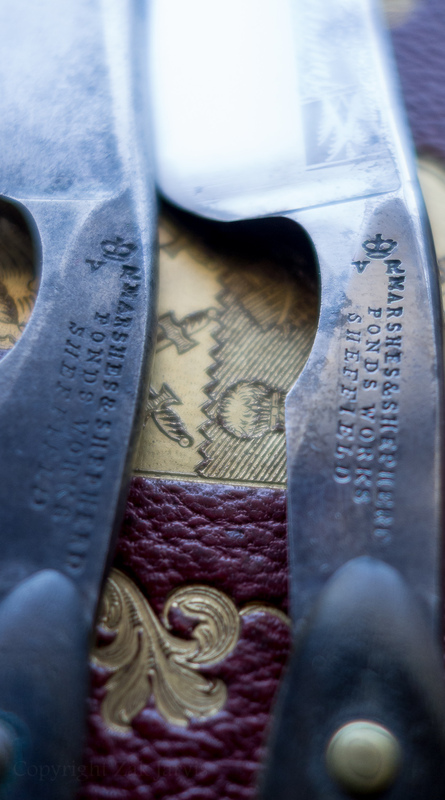 You can read about the first of these two Marshes & Shepherd razors here, the one on the left I got more recently, but is far less interesting. It would be possible to leave the subject off here, at the end of Victoria’s reign. It would be possible, but it would leave out the confusing part. First I should say that I have seen (though do not own) a very few razors stamped with ER — Edward VII6. George V, 1910-1936. 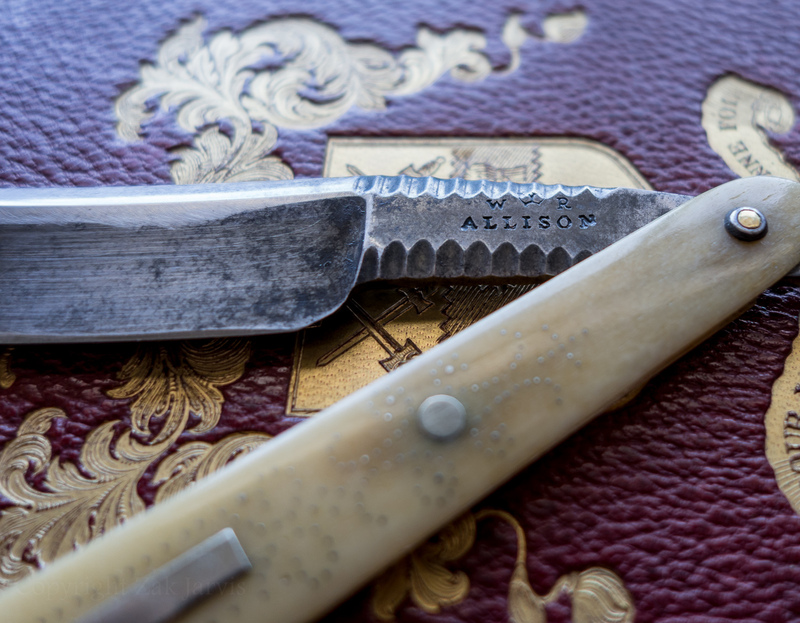 When I first saw a Weiss razor with the GR stamp I was absolutely certain that it was from the 1820’s. I mean, that’s when George IV was spending all the money in the world on curtains, right? 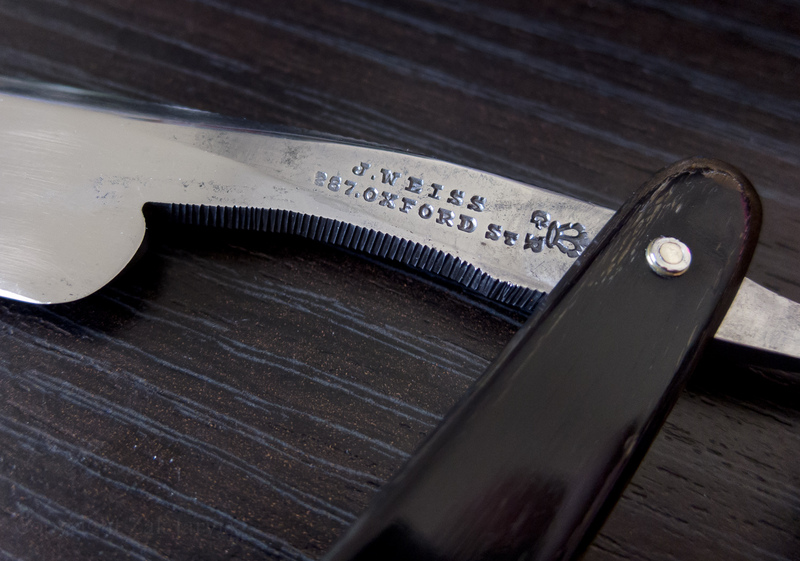 It wasn’t until much later — after I got this razor — that I learned that J. Weiss & Son didn’t move to 287 Oxford street until 1883. Interestingly, the crown was double-struck on this and because of that you can see that the letters were a separate die. The problem is that one of the standard references for these sort of things, namely Goins directory, has an incredibly confused and inaccurate listing for John Weiss. According to Goins, Weiss at 237 Oxford Street, with a GR stamp, is from the 1820’s. 237 is clearly a misreading of 287, probably from a partial stamping. Then Goins compounds the error by listing Weiss at 287 Ford street in 1889, again misreading of a partial stamp. 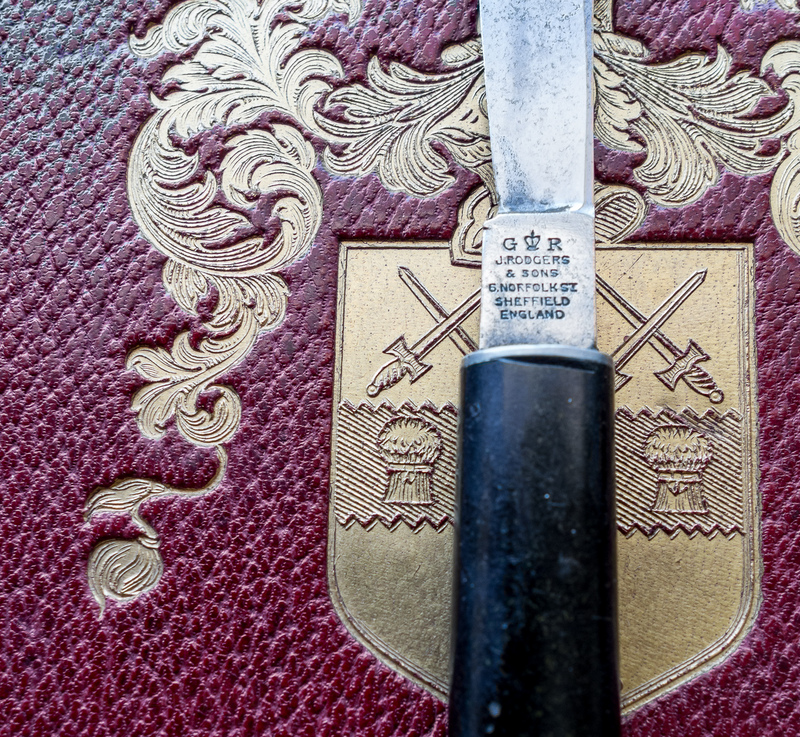 It’s all kind of understandable, because everyone knows GR stamps are for George IV. The problem is that Weiss used the mark well into the 20th century, and they weren’t the only ones. This Joseph Rodgers ink eraser has an unambiguous GR stamp (I got it assuming it was George IV), but the handle is made of vulcanized rubber, a material that didn’t come into use until the 1870’s, and it is also stamped England, which wasn’t used until 1890, when the McKinley tariff7 went into effect and mandated that all items made for international sale would bear their country of origin. That should help clarify the English monarch stamps, and I hope it demonstrates a little bit why rote knowledge is dangerous. If you come across a razor with a crown stamp and two letters that aren’t covered here (I’ve seen some), chances are good they aren’t English.